GBA Sonic Advance (USA) "Tails, no Ultraspindash" in 13:33.54 by GoddessMaria. Sonic Advance was Sonic the Hedgehog's first appearance on a portable Nintendo console, and he brought all his friends with him. In this run, Tails shows what he's capable of and sets off to defeat Dr. Eggman once again. 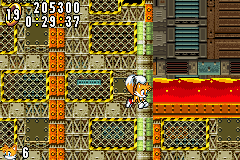 He aims to do so as fast as possible without using the game-destroying glitch featured in this run as Sonic. If you want to see more Sonic Advance runs, check out the run as Knuckles, Amy and an alternate run as Sonic where the aforementioned glitch is not used.